At first it seemed crazy to try to host a lunch playdate mere hours before packing up the family for a long weekend away. But necessity, of course, is the mother of invention, and this mother finally struck upon an old favorite that made the busy day a breeze to pull together: Soup. Soup is one of few things that seems to equally please children and adults at the table. I don't know why a child who can't stand to have different foods touching each other on the plate will happily dig into a bowl of soup, or why one who gags at the sight of beans won't notice them immersed in broth. It's miracle food, and a great way to get kids to devour protein and vegetables. 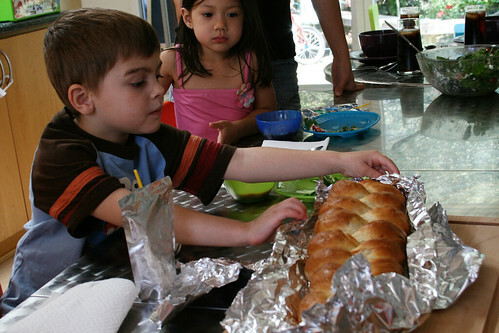 Calvin wanted to prepare a favorite from his kids' cooking class, a bread braided with sausage and cheese. He did much of the work preparing it the day before our lunch date, but left the shaping to me. (For something similar, try this recipe.) That night, after packing the kids' suitcases, I rooted around in the fridge and began making minestrone. Minestrone is a year-round favorite of mine. It's a versatile soup, adaptable to the season, and it can be served piping hot in winter or at room temperature in summer. Luckily, I had just enough vegetables to pull it together: carrots, onions, green beans, potatoes, and the first zucchini from the garden. I chopped and diced, stirred and simmered, and set the nearly done soup in the fridge just after adding the beans. The next day, I had little to do but enjoy good company. Close to lunchtime, I warmed the soup and cooked the pasta, then put the foil-wrapped bread braid in the oven to warm. I finished the plates with an easy salad of baby spinach, sliced strawberries, goat cheese, and a raspberry vinaigrette. For dessert, the kids had snowballs. In the morning I had used a melon baller to scoop small balls of vanilla ice cream, rolled the balls in shredded coconut, and then set them on a plate in the freezer to firm up. Ice cream as finger food! And it only took about 10 minutes. An hour after our satisfied lunch guests departed, the dishes were washed, the last suitcases were packed, and we were off for our holiday weekend. The fridge was bare, but the freezer held leftover minestrone to welcome us back home. For a bright, summer taste, I use lemon thyme and lemon basil from the garden. Play with the seasonings -- the herbs, salt, and pepper -- to suit your taste. Use different vegetables according to your preference and the season. The list here reflects what I happened to have on hand, but other options include new potatoes, leeks, spring garlic, and spinach. If you find all the slicing, dicing, and cubing intimidating, a food processor is a big time-saver; alternatively, you could use frozen veggies. I used Trader Joe's Organic Alphabet Pasta as a kid-pleasing touch. Heat the olive oil in a Dutch oven over medium heat. Toss in the onions, stir, and cover. Cook, stirring occasionally, until the onions begin to turn golden (about 15 to 20 minutes). Continue to cook, uncovered and stirring occasionally, until the onions are nicely caramelized. Toss in the potatoes, carrots, celery, and green beans, stir, and cook about 10 minutes. Add zucchini and cabbage and cook 5 minutes more. Stir in the broth, water, tomatoes, herbs, salt, and pepper. (If you're using basil, set it aside for now and stir it in when the soup is nearly finished.) Cover and simmer over low heat for an hour and a half, then add the beans. Cook the pasta according to the package directions, drain, then add the pasta to the soup. Ladle into bowls and garnish with a sprinkling of cheese.